One of the worst problems threatening road safety is speeding. It makes sense. All of us are very busy and need to get to where we need to be as soon as possible. However, speeding can be extremely dangerous not only to yourself but to others on the road as well. In addition to that, there is a psychological concern with speeding as well. If you’re constantly speeding, you might be engaging in other dangerous driving behaviors as well. These actions could lead to a crash that may result in injuries, fatalities, and heavy vehicle damage. 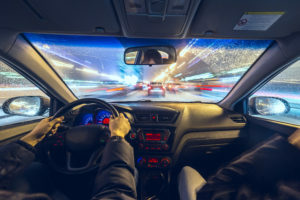 According to the National Highway Traffic Safety Administration, there were nearly 10,000 fatalities from speed-related crashes. In total, speeding was a contributing factor in 27% of all fatal crashes in 2015. Although this is lower than the two-decade average (33%), this is still a far too high a number and one that can easily be reduced. If you find that you’re speeding often, consider why you’re doing it. Take a look at your schedule and see if there are ways to reduce it or at the very least reorganize it so you can give yourself more time. Although all of us are busy and hate being stuck in traffic, speeding is simply not worth it.